Dale came through the youth ranks at United. After earning his first couple of starts in the side, he was sidelined for nine months with injury. After recovering, he played in the reserves, but could not get back into the first team. He was transfer listed in May 1998 and released a year later, joining Sligo. Dale was born on this date in Edinburgh. United dominated the opening stages and the Bankies had a narrow escape in the 12th minute. Paul Walker fed Ben Honeyman who whipped in a shot which Matthews couldn't hold and only Currie's intervention as he scrambled the ball away for a comer prevented Paul Walker giving United the lead. Honeyman then shot narrowly over. The young United newcomers were doing themselves no harm at all with Stuart Gilmour firing fractionally wide after a 20 minutes which had been totally dominated by the Tangerines. 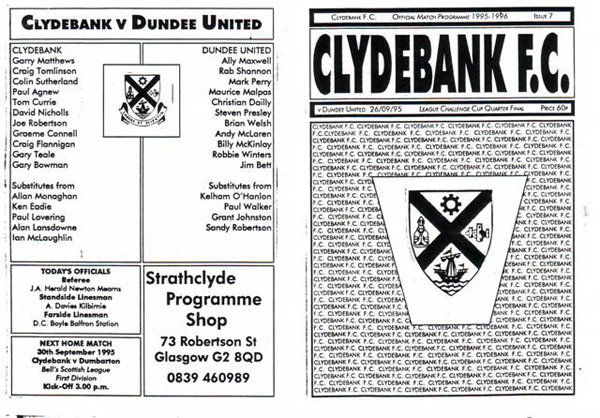 Manager Billy Kirkwood made six changes from the side which won at Dens Park as United attempted to reach the final of the League Challenge Cup in their debut in the competition. Steven Pressley had an ankle injury and Billy McKinlay's bruised toes kept him out. Jim Bett was rested and Kelham O'Hanlon took over from Ally Maxwell in goal. The other two to come in were Brian Welsh in defence with Sandy Robertson and Dale Gray.